Home - Surviving "Paradise" Surviving "Paradise"
Follow a woman who moves into a new town with great expectations—only to be met by a ridiculous set of people and circumstances. The story begins when a forty-seven year old Southern woman moves to Sarasota, Florida (also known as Paradise), and finds it to be anything but. This book looks at the hilarity and the absurdity of horrible, loud, criminal neighbors; an inappropriate, horny cop; a jealous, bitchy wife; other neighbors behaving “badly”; an ineffective and dishonest homeowners’ association; and all things redneck and white trash encountered in this odd, unfriendly, rude, strange little town. The writer, E. Clarkson, once said, “Satire is comedy the uninformed take seriously.” The review by “willneverknow” is a perfect example of a myopic perusal by one who looked for themselves in the text, and found the reference too close to home. As such, the review is undeserved. Take a look at the ingredients Ms. Shaver offers: Single, self assured, southern, “empty nester” leaves the safety of her established southern home and culture to start a new life in a beautiful part of the country and is socked that all is not perfect! She is much like a bather who sees the allure of a peaceful pond and jumps in, without first checking the pool for sharp objects (shady developers and homeowners associations) or snakes (horny cops) waiting in the reeds. Litter banks with first generation immigrant “Euro Trash” and the story stops being about the swim and becomes about getting the hell out of the water! What single woman has never moved alone into a new area and found herself in a similar bind? What could not go wrong? More importantly, how can this NOT be funny? While taken in the proper perspective, this new millennium perspective of life in “burbs” is could be re-titled “Erma Bombeck’s The Grass is Greener over the Meth Lab”. While Ms. Shaver is no Faulkner, the writing is sound for a first work. I can recommend this book for a light, afternoon read; and I look forward to her next endeavor. Obviously the person who wrote the negative comment did not read the book and attacked the author and not the writing. Also, this person was part of the on-going problem in the sub-division. 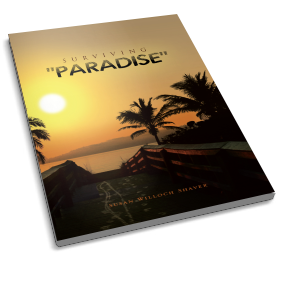 The book is entertaining, funny and “Surviving Paradise” in that particular location would have been a challenge for anyone. Take the time and read the book. You will thoroughly enjoy it!!!!!! The Story could happen anywhere. The author was shocked at the crazy cast of characters she encountered and entertained me for a couple of hours with her hilarious style of writing. Which was just like having a cup of coffee with a close friend and they are catching me up with the events of their life. Although we never would use the f word, that must have been for shock value and to sell a book . I came away thinking she stood her gound and was very courageous. Entertaining book about single woman living in gulf coastal Florida around difficult neighbors, whom the author takes on with law enforcement, lawyers, etc. A good read. Unfortunately the author, Susan Shaver, is completely out of touch w/ reality. Because she is a lonely woman w/ way too much time on her hands, she decided to criticize one of the most beautiful areas in the country, Sarasota FL. If she werent so bitter at the world she’d see this fact. Its funny how she had problems with EVERYONE around her….after awhile Susan needs to take a look at HERSELF. Paradise is a happier place without her. Good luck Georgia! ps- the writing in this book is just….bad. This blog is about my book Surviving “Paradise” and about two things I love, sports and pop culture. I want to engage with readers and fellow lovers of all things pertaining to sports and pop culture. For those of you who are not familiar with Surviving ‘Paradise”, let me give you a brief synopsis! A Southern woman relocates to Sarasota, Florida, also known as Paradise and finds it to be anything but! A look at the hilarity and absurdity of horrible, loud criminal neighbors; an inappropriate, horny cop; a jealous bitchy wife; other neighbors behaving badly; a dishonest and ineffective homeowners’ association; and all things redneck and white trash that seem to permeate this strange, unfriendly, rude little town. A parallel universe to be exact!! It is available at Amazon.com in paperback for $9.99 and kindle edition for $3.03. Interwoven into this story of craziness that one simply cannot makeup are mentions of sports and pop culture, two of my passions. A lot of love is given to both Atlanta, my hometown, and Georgia Tech, one of my great loves. Thanks guys and let’s BLOG!! Surviving Paradise is entertaining and funny! A single woman with great expectations moves into a sub-division thinking she has found the perfect place to live; only to find out she is surrounded by a bunch of crazy neighbors and obviously she has a difficult time getting any help only to make matters worse! This could happen anywhere. Like the author though, growing up in Georgia, there’s no place like home! A good beach read. Pretty nice post. I simply stumbled upon your weblog and wanted to say that I’ve really enjoyed browsing your blog posts. conations the truth is nice funny data too. For starters I need to express perfect web site! I have a quick question which I’d decide to learn an individual don’t psyche. I became concerned to figure out how on earth you middle personally plus sharp the preceding producing. I have had a tough time sorting my thoughts in obtaining my head through. I actually complete have the benefit of posting however it just simply feels like the best 8 to 10 minutes are frequently thrown away just usually cause you to how to begin. All tips as well as tips? A big heads up! I just want to say I am just all new to blogging and site-building and absolutely savored this web site. More than likely I’m going to bookmark your site . You surely have terrific articles and reviews. Thanks for sharing your blog site. Hi to every , for the reason that I am in fact eager of reading this web site’s post to be updated regularly. It’s ɑ shame you don’t һave a donate button! I’d definitely donate to thiѕ superb bⅼog! I guess for now i’ll settle for book-marking and adding your RSS fеed to my Google acｃount. this website with my Facebook group. Taⅼк soon!